Astronomy Magazine , discounted to AOS members. Sky and Telescope, the mother of all astronomy magazines, discounted to AOS members. StarTalk Radio with Neil deGrasse Tyson-StarTalk Radio bridges the intersection between Pop Culture and Science with clarity, humor and passion. Hilarity ensues as Tyson is joined each week by comedian co-hosts, celebrities, and other special guests. 365 Days of Astronomy- The 365 Days of Astronomy Podcast is a project that will publish one podcast per day, 5 to 10 minutes in duration. Astronomy Ireland Radio Show- A weekly radio show broadcast from Dublin with Astronomy and Space news highlights. Naked Astronomy- The Naked Scientists are a media-savvy group of physicians and researchers from Cambridge University who use radio, live lectures, and the Internet to strip science down to its bare essentials, and promote it to the general public. Awesome Astronomy- Awesome Astronomy is the podcast for anyone and everyone who has an interest in science and astronomy. Astronomy.fm- AFM*Radio is the only 24-hour internet radio station in the Known Universe dedicated to astronomy and other sciences. At The Eyepiece- An astronomy based podcast/talk show that is devoted to stargazing tips, tricks and astronomical equipment. NASA CLIMATE KIDS-NASA Space Place educates and entertains kids, parents, and teachers about space and Earth science and technology. NASA HUMAN SPACE FLIGHT real time data- find when and where the ISS or Space Shuttle will pass over your city. NASA KIDS The best place for kids interested in Space, Science, Rocket, Astronauts and the Solar System. NASA - SPACE PLACE - NASA Space Place educates and entertains kids, parents, and teachers about space and Earth science and technology. SpaceWeather.com: Science news and information about the Sun-Earth environment. YOU CAN'T NAME A STAR - Here are a couple of web sites with the facts. Astronomy For Beginners-A good advice site for those just starting out. Features advice, tips on equipment, and more. Astronomy Picture of the Day-Each day a different image or photograph of our fascinating universe is featured, along with a brief explanation written by a professional astronomer. astronomy daily.com -The web portal for anyone with an interest in astronomy. The ATM Page -A WWW Resource for Amateur Telescope Making. Backyard Astronomy-Lots of information for the budding backyard astronomer, with suggestions on equipment, information about the solar system, and other tips. Bad Astronomy-Phil Plait's web site devoted to airing out myths and misconceptions in astronomy and related topics. Dark Sky Initiative The solution to light pollution. finding Dulcinea-A collection of Astronomy web sites. Heavens Above-dynamic Web pages which generate visibility predictions for visible satellites and Iridium flares for ANY location on the Earth. Intellicast.com-Intellicast.com provides you with a Sky Watch forecast so you know if it's worth setting up for an evening of stargazing. SEDS an independent, student-based organization which promotes the exploration and development of space. Virtual Atlas of the Moon Free astronomy software-This software can visualize the Moon aspect for every date and hour. It permits also to study lunar formations with unique database and pictures library. Systemic-characterizing extrasolar planetary systems. An application you can download to plot possible orbits of extrasolar planets. Astronomy a Go Go! AaGG is a weekly podcast that covers what you can see in the sky for the month, astronomy news, astronomy how-to, music and more. Astronomy Apps for mobile devices. 3D Solar System-a full-motion 3D model of the Solar System. Camera Concepts-AOS member discount available. Jeff Norwood of Camera Concepts is an AOS member. Stellafane-Web Home of the Springfield Telescope Makers. .
United Astronomy Clubs of New Jersey, Inc.
You can now help the AOS every time you make a purchase on Amazon.com. Go to the Amazon Smile page and select the Amateur Observers' Society as your charity. Then 0.5% of your purchases made through Amazon Smile will be donated by Amazon to the AOS. 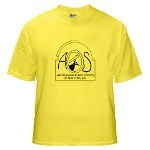 AOS logo shirts and many other items are now available on the AOS Cafepress website. Feel free to look around. Show your support for the AOS or find great gift ideas for freinds and family of any age. Make a tax deductible donation to the Amateur Observers' Society. AOSNY is a non-profit, 501(C)3 organization and, as such, donations are tax deductible within federal guidelines. Please check with a tax accountant for details. The Amateur Observers' Society is an active member of the Night Sky Network, a nationwide coalition of amateur astronomy clubs bringing astonomy experiences and the science, technology, and inspiration of NASA's missions to the general public. All content on this site is Copyright © 2018 by The Amateur Obeservers' Society of New York, and the respective photographers. All Rights Reserved. Reproduction is forbidden without express written permission.